Aquafaba, in case you somehow haven't heard of it by now, is the viscous broth from canned or cooked chickpeas and it makes an excellent egg substitute in baking. (It is so-named because the terms "bean juice" and "brine" just didn't sound appetizing to most of the posters on the facebook page mentioned in the next paragraph.) Use about 3 tablespoons per average egg, or 1/4 cup for a large egg (you don't have to whip it for this use-- just use in its liquid form). This use for aquafaba as an egg replacer in baking was first posted by author/blogger, vegan cook extraordinaire Somer McCowan here. I've used it successfully in cornbread, too. If you are unfamiliar with aquafaba egg or egg white replacer, see the Facebook page Vegan Meringue- Hits and Misses! There are about 8,000 enthusiastic members, eagerly discussing the applications, possibilities and limitations of this seemingly magic liquid that can be whipped into a meringue. There you will find recipes files for meringues, macaroons, pavlovas, nougat, whipped toppings, etc., a;; made with this miraculous elixir! And you will be amazed! My humble contribution to the files on that Facebook page is how to make your own aquafaba that is viscous enough to whip up nicely like egg whites, or to use in liquid form as a whole egg substitute in baking, and how to store it in usable portions for recipes. I have not really explored the meringue much yet, since we are not eating many desserts of late-- I'll wait until the next birthday or holiday to experiment! 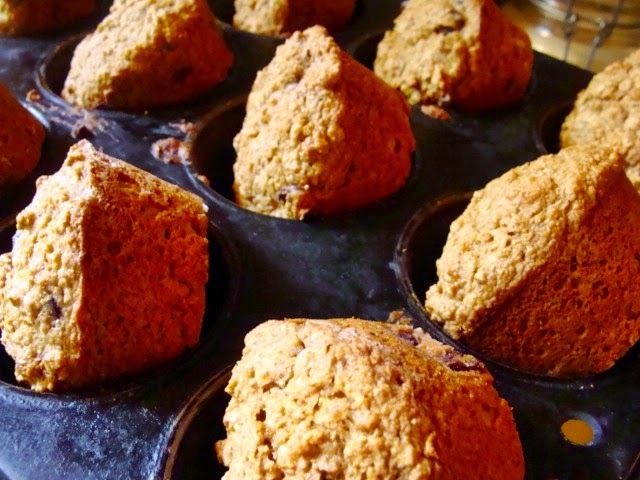 However, I made some muffins for company earlier this week and worked from an egg-based recipe to devise a low-fat, whole grain vegan muffin that was not only delicious, but moist and tender. They didn't last very long! 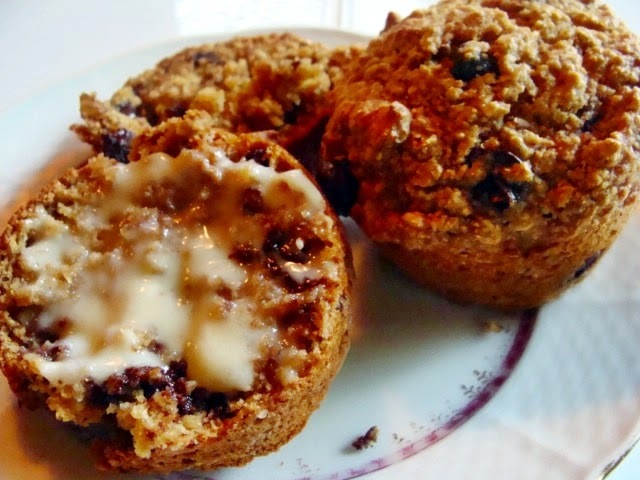 Only 2 tablespoons of oil in this recipe for 12 good-sized muffins! 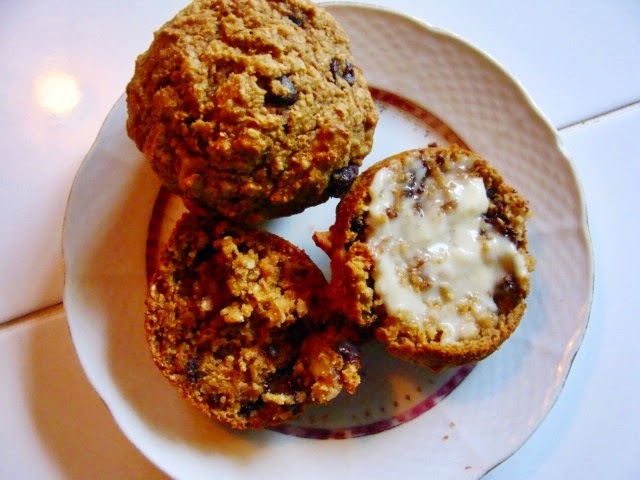 COOKING TIP: Pastry flour makes a more tender muffin, especially in a recipe like this, using very little fat. You can use white whole wheat pastry flour, if you like-- it's made from white wheat. But the color of this muffin is brown due to the maple syrup, so ordinary whole wheat pastry flour is just fine. 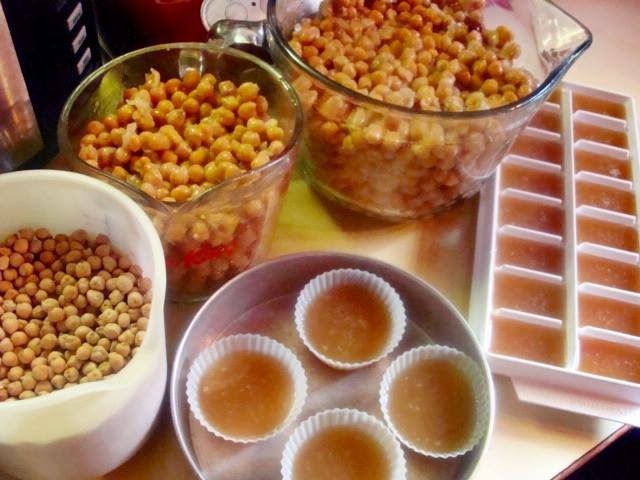 1/4 cup (4 Tbs) aquafaba (the broth from cooking chickpeas or drained from canned chickpeas-- see text above) NOTE: No need to whip the aquafaba for this type of recipe-- use in liquid form. PS: Feel free to add your own combinations of Additional Ingredients. 1. Set the oven temperature to 350 degrees F. Oil a 12-cup muffin pan (or use cake release-- here's my homemade palm oil-free, non-hydrogenated cake release recipe). 3. In a deep pitcher or bowl, mix together the Wet Ingredients and whisk by hand or blend with an immersion/stick blender for several minutes, or until bubbly. 5. 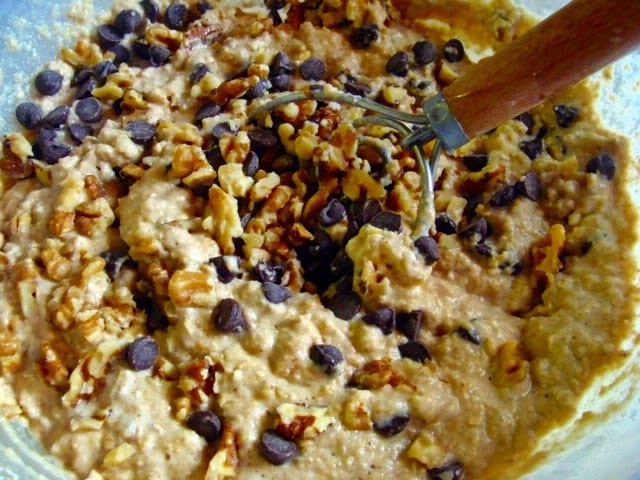 Add any Additional Ingredients you are using and fold gently into the batter. 6. Divide the batter between the 12 muffin cups (using a gently rounded 1/3 cup measure). Bake for 20 minutes. 7. Place the muffin pan on a cooling rack and loosen the muffins with a table knife, setting them gently on their sides in the pan to cool. NOTE: The nutrition facts for this recipe were calculated (with Living Cookbook recipe software) using raisins and walnuts. If you use chocolate chips or dried cranberries instead of raisins, the calories and fat will be a bit higher. If you omit the nuts, you will save almost 50 calories and several grams of fat. 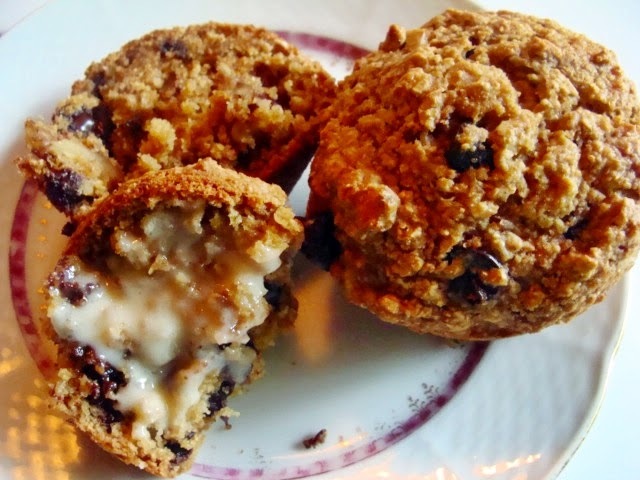 Nutrition (per muffin): 244 calories, 63 calories from fat, 7.4g total fat, 0mg cholesterol, 201.6mg sodium, 344.4mg potassium, 42.8g carbohydrates, 4.3g fiber, 16.5g sugar, 5.2g protein. We have a bulk food store in our nearest town now, and they carry an interesting array of whole grains. One that caught my eye was "Purple Prairie Barley", so I bought a small amount. But I never got around to using it until a few days ago. I knew already that barley is a grain very low on the glycemic index, providing slow-acting, longer-lasting energy, and that it's a good source of soluble (viscous) fiber, too. 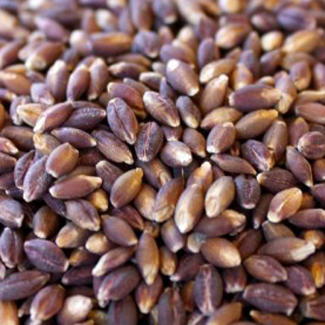 Purple barley has an added bonus in that it is a variety sometimes called “naked barley,” or hull-less barley, which doesn't need pearling, so it still has the bran and germ intact. In addition, as we know, the colors in foods usually indicate the presence of antioxidants, and that's certainly true of purple barley! "A press release on 15 August, 2011 by Ohio State University announced that anthocyanins, chemicals that offer red, blue and purple color to foods, are capable of inhibiting the growth of cancer cells while keeping healthy cells intact... Lead author of the study, Dr. Monica Giusti, commented, “These foods contain many compounds, and we’re just starting to figure out what they are and which ones provide the best health benefits.” Giusti added, “All fruits and vegetables that are rich in anthocyanins have compounds that can slow down the growth of colon cancer cells, whether in experiments in laboratory dishes or inside the body.” ...The bran fraction of purple barley has a significantly higher antioxidant activity than its paler cousins, by as much as six times." So this is a really nutritious grain, besides being a lovely color! It also has a nice chewy texture-- it's not mushy or slimey. I decided to make a hearty full-meal salad with my cup of Purple Prairie Barley, utilizing foods that I had in the refrigerator and pantry already. The result was delicious, nutritious and very colorful! 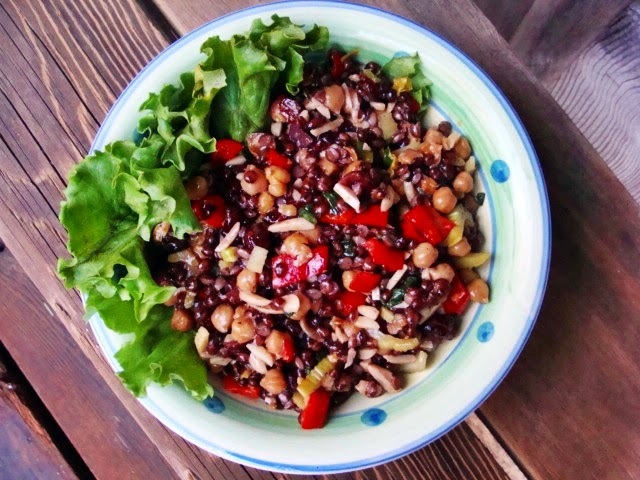 This beautiful whole grain, bean and vegetable salad was a real hit and so nutritious! 1. To cook the barley, mix the barely, water and salt in a small saucepan and bring to a boil. Turn down, cover and cook on Low for about 1 1/2 hours, or until the barley is tender, but a bit chewy, and all of the water has been absorbed. Cool at room temperature. 2. While the barley cools, prepare the other salad ingredients and make the Dressing by whisking or shaking all the ingredients together. 3. 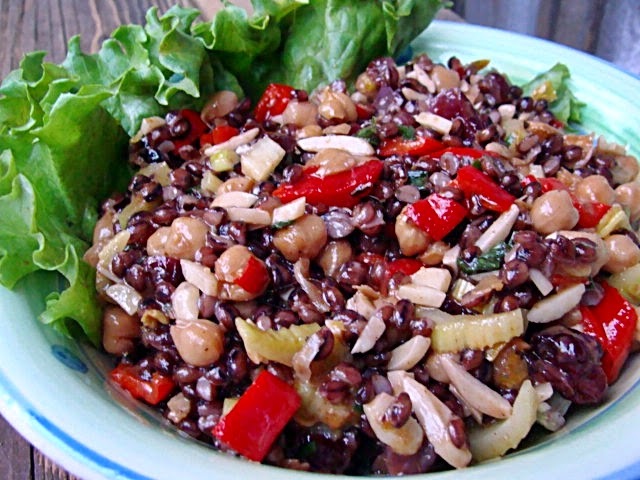 Combine the cooled barley, other salad ingredients and dressing and refrigerate. The salad is best when served at room temperature. The same day that I made the salad, I needed to use up some of my homemade vegan "ricotta", and I also had some of my "Potted Tofu" in the fridge that was getting quite "ripe"! (The links to the recipes are in the recipe below.) I decided to make a spread-- spreads are always handy to have around to use on rye crisp, toast or vegetables for a quick snack. It turned out very well! Combine all of the ingredients EXCEPT the sundried tomatoes in a food processor or high-speed blender and process until smooth. Add the tomatoes and process briefly-- you want it to have a little texture. Scoop the spread into an attractive bowl, smooth it out, drizzle with olive oil and garnish with the olives and parsley. 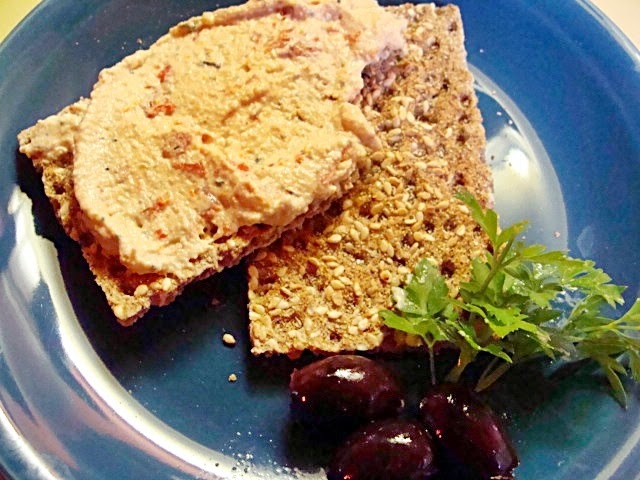 Serve with crackers (we like rye crisp), thin slices of crusty bread, or raw vegetables. UPDATE! Jeannie, another Blogger, wrote and asked me how this shortening would work in a vegan "buttercream" frosting and how it would hold up at room temperature. I didn't want to make a big dessert, since we overindulged at a family event over the last two days, so I made a very small version of my basic vegan "buttercream": 1/2 cup of the Rainforest Shortening, frozen and sliced into tiny cubes; 12 oz. organic powdered sugar, 5 tsp. non-dairy milk or other liquid of choice; 1 tsp. vanilla. I beat it in an electric mixer until fluffy and left it at room temperature (albeit, not super-warm) for about 5 hours and then spread it on some tiny ginger snaps-- it held up nicely! After I developed my palm oil-free vegan "Buttah" and worked on it until I was satisfied enough to share it with the wider world (see http://vegan.com/recipes/bryanna-clark-grogan/bryannas-vegan-butter/ and http://veganfeastkitchen.blogspot.ca/p/introducing-homemade-palm-oil-free.html ), I played around with developing a palm oil-free vegan shortening that would be firm, but higher in monounsaturated fat than polyunsaturated or saturated fat. But it went by the wayside as I pursued other projects. Shortening doesn't play a large part in my cooking style, so it wasn't terribly important. But this week I was wondering if I could make a low-fat (or lower-fat) vegan pastry that was more flaky than the oil-based pastry that I've used and enjoyed for years. I decided that I needed to use a solid fat, but I didn't want to resort to anything made with palm oil or hydrogenated fats, or even the darling of the moment, saturated fat-rich coconut oil. (Why not? I recommend this article and the information here, here and here.) So I revisited my palm oil-free shortening recipe and quickly had good results. This shortening has exceeded my expectations. It's easy to make and contains only 3 ingredients. It contains more liquid oil than solid fat, and yet stays solid in the refrigerator. (It will not stay solid at room temperature. I recommend keeping it frozen until use.). It contains more monounsaturated fat than the saturated or polyunsaturated fats, which is a good thing. (Read this article for information on that and on the confusing reports about fats in the last few months.) And it worked beautifully in my new, flakier low-fat pastry recipe (recipe below), which uses HALF the fat of a traditional pastry recipe. FOR INFORMATION ON INGREDIENTS AND EQUIPMENT, AS WELL AS FATS AND THE PALM OIL PROBLEM, SEE THIS PAGE. The shortening looks yellow due to the color in the lecithin, which emulsifies the two fats. © Bryanna Clark Grogan 2015. All rights reserved. NOTE: I use deodorized cocoa butter in my homemade palm oil-free vegan “Buttah”, but you can use the less expensive “natural” (UN-deodorized) type of cocoa butter for this recipe, since it contains only a small amount. The cocoa butter you use should NOT be soft at room temperature-- it should be very hard and almost shatter when you cut it. EQUIPMENT: You will need a small kitchen scale for this recipe-- it is the most accurate way to measure the cocoa butter. You will also need an inexpensive candy thermometer; 6 medium-sized silicone cupcake liners, or a silicone ice cube mold that makes 6 or 8 large ice cubes (½ cup each), or 2 silicone molds that will each hold a little over a cup; a deep heat-proof (Pyrex) bowl or measuring vessel that holds at least 4 cups; and an immersion/stick blender. Have ready 6 medium-sized silicone cupcake liners, or a silicone ice cube mold that makes 6 or 8 large ice cubes (½ cup each), or 2 silicone molds that will each hold a little over a cup, placed in 2 small cake pans. Immediately divide the mixture evenly between your silicone molds. Place right away into the freezer for about an hour. The shortening should be solid and easy to be released from the liners or mold, wrapped in plastic wrap and kept frozen. Nutrition (per tablespoon): 108 calories, 108 calories from fat, 12.2g total fat, 2.46g saturated fat, 6.31g monounsaturated fat, 2.86g polyunsaturated fat, 0mg cholesterol, 0mg sodium, 0mg potassium, 0g carbohydrates, 0g fiber, 0g sugar, 0g protein. The plasticity of shortening makes it very easy to rub or cut into flour – resulting in a very flaky, crust. This tender lower-fat crust is flakier than my oil crust for that reason, but utilizes my non-hydrogenated, palm-and-coconut oil-free homemade shortening for more monounsaturated fat than saturated and polyunsaturated. And I use half as much shortening as the classic Crisco pie crust recipe of the same size. NOTE: Return the shortening to the freezer while preparing the other ingredients. 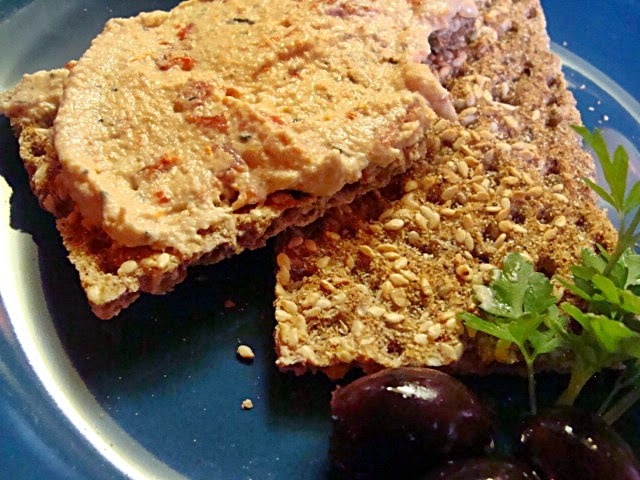 TIP from Betsy DiJulio of The Blooming Platter of Vegan Recipes: "I freeze my shortening (and "butter") for biscuits, grating it into the fllour, so your hands barely touch it and, hence, don't begin to melt it. Just spray your grater with nonstick spray first for easy clean-up." In a medium bowl, whisk together the two flours, salt, baking powder and sugar. Add the cubed shortening to the flour mixture and, using a pastry blender, 2 knives, or your fingertips, cut or rub the shortening shortening into the flour. Occasionally, make sure you reach down into the bottom of the bowl and toss the ingredients to make sure all of the fat is combined with the flour mixture. Continue until the shortening is broken into pieces the size of small peas among smaller particles. Pour the yogurt mixture into the dry mixture and quickly mix with a fork until you can press the mixture together into a ball. If dry particles remain, add a few drops of water-- just enough to moisten. Flatten the dough a bit, place in a plastic bag and refrigerate for at least an hour before rolling out. NOTE: Roll out on baking parchment or a silicone mat to avoid using alot of flour. Nutrition (per serving): 142 calories, 7 calories from fat, 7.3g total fat, 1.42g saturated fat, 3.61g monounsaturated fat, 1.71 polyunsaturated fat, 0mg cholesterol, 121.1mg sodium, 91.1mg potassium, 17g carbohydrates, 1.7g fiber. I haven't been blogging for weeks now! Between the holiday, granddchildren visiting, and getting over a cough that just doesn't want to quit, time has gotten away from me! Today I made this soup for our lunch. I've been making it since the 1970's, but have never posted it, for some reason. Took it for granted, I guess. It's a soup version of Francis Moore Lappe's recipe for Lentils, Monastery Style in her ground-breaking book "Diet for a Small Planet", which was very influential in starting me on the road to vegetarianism. I have made a few changes over the years-- this is the latest version and I thought I'd share it with you. This soup was perfect for this chilly April day with some home-baked bread. 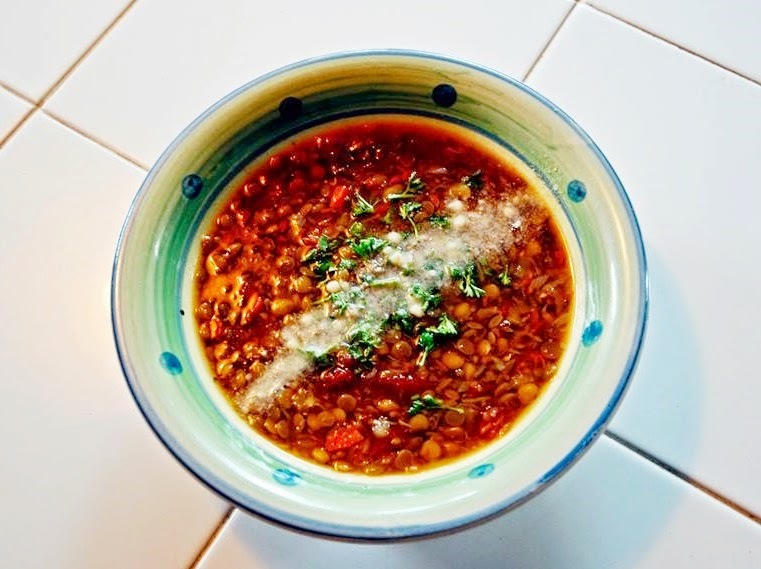 This soup makes a good addition to anyone's repertoire of lentil recipes-- simple, yet sophisticated and full of flavor; filling, yet low in calories. With a food processor to chop the veggies, it's very easy to throw together. PS: The wine is important! 1. In a large pot sprayed heat the oil over medium high-heat. Add the onions and carrots and sauté until the onions have softened. OR, alternately, you can place the olive oil, chopped onions and carrots in a microwave-safe bowl or casserole and microwave, covered, on High power for about 5 minutes, or until the onions have softened. 2. Combine the vegetables in the soup pot with the marjoram, thyme, and bay leaf, broth, tomatoes (or tomato paste), water, lentils, and salt. 3. Bring the mixture to a boil, then lower the heat, cover, and simmer for 1 hour, or until the lentils are tender. Add the wine, parsley, and pepper to taste. Simmer a few more minutes, taste for seasoning and serve with the vegan Parmesan sub or grated vegan cheese, if you like. Nutrition (per serving): 206 calories, 44 calories from fat, 5g total fat, 0mg cholesterol, 933.7mg sodium, 590.5mg potassium, 30.4g carbohydrates, 11.9g fiber, 7.6g sugar, 10.9g protein.